Sapphire to Metal Seal | IJ Research, Inc.
IJ Research has long been known as a leading supplier of sapphire to metal seals. 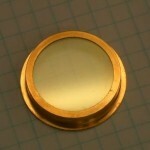 We use sapphire as optical windows and insulators in hermetic feedthroughs. You can rely on us for high quality sapphire, window design, A/R coating, and optical specification guidance to meet your needs. We believe that IJ Research is one of, if not the, largest sapphire user in the US for hermetic seal and brazing applications. We have used the terminology “Sapphire to Metal Seal” going back to 1988 when IJ Research brazed UV grade sapphire window for the US Navy Arc Detector project. In more recent years, we have used sapphire and ruby as the electrical insulator for several medical implant feedthroughs. Please click for a PDF copy of the brochures, Hermetic Seal, Metallization, Ceramic to Metal Seal, Sealing Glass List.